Joe's River is a seasonal watercourse, which drains precipitation from the surrounding hills. 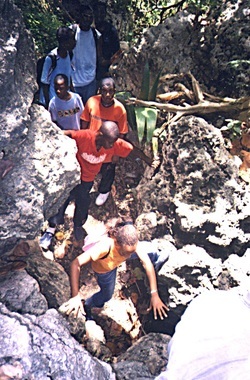 Joe's River Gorge, near the Bathsheba Community, is packed with boulders, which hikers must engage, and scramble up and over. Moderate fitness and a healthy sense of adventure, are a must for this hike trail. It's subdued lighting in the Gorge, somewhat like being in a cave, but with the roof off. Water flow conditions in the Gorge can range from a quiet trickling stream, to a raging torrent ( at this stage no tour is available). Lookout for the skittish fresh water shrimp feeding in the pools. You may also get to observe a solitary Green Heron (local name Gaulin), stalking fish or insects. Hum! Should we go this way? Boulders of coral stone everywhere and the way forward can be confusing at times. and the Trail's flora and fauna. Vacation Campers get excited about the Gorge's rugged adventurous terrain. It's great fun for the young and the young at heart. comfortable loose fitting clothing, sturdy enclosed footwear, a backpack, personal medication (asthma inhalers etc. ), drinking water (2 liters), trekking pole (if needed), sun protection - a hat, sunblock.